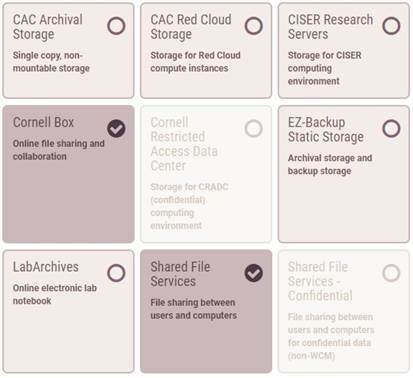 The Research Data Management Service Group (RDMSG) is pleased to announce the launch of the Data Storage Finder, a self-service, interactive tool to select storage services based on features important to you. Choose just those you want to learn more about, or explore and compare them all, in one easy-to-use webpage. The Data Storage Finder asks questions about your volume of data; backup, performance, and sharing needs; data type; and ease of access. Your answers focus the range of options to just those that fit your criteria. You can then select from those for a side-by-side feature comparison. Try the Data Storage Finder!